Over the weekend, nations struck a deal to breathe life into the landmark 2015 Paris climate treaty. 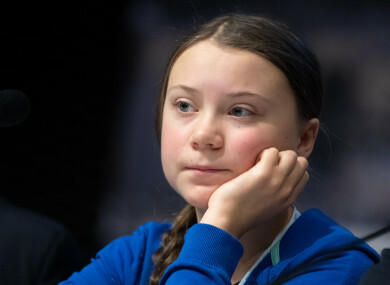 15-YEAR-OLD Swedish environmental activist Greta Thunberg has told world negotiators at the United Nations COP24 conference that they are “not mature enough” to “tell it like is” when it comes to climate change. Over the weekend, nations struck a deal to breathe life into the landmark 2015 Paris climate treaty after marathon UN talks that failed to match the ambition the world’s most vulnerable countries need to avert dangerous global warming. Delegates from nearly 200 states finalised a common rulebook designed to deliver the Paris goals of limiting global temperature rises to well below two degrees Celsius. States already dealing with devastating floods, droughts and extreme weather made worse by climate change said the package agreed in the mining city of Katowice lacked the bold ambition to cut emissions the world needed. Addressing the conference in Krakow, Poland last week, Thunberg accused negotiators of “stealing” the future from future generations. "You say you love your children above all else and yet, you're stealing their future in front of their very eyes." “You only speak of green eternal economic growth because you are too scared of being unpopular. You only talk about moving forward with the same bad ideas that got us into this mess, even when the only sensible thing to do is pull the emergency brake,” Thunberg said. Thunberg has become a leading name in the growing campaign from youth across the planet, pleading on lawmakers and corporations to slash greenhouse gas emissions and avert runaway global warming. She shot to fame back home after she began a one-child strike outside the Swedish parliament, which she said she will continue until the government commits to action that will honour the promises it made in Paris. She said that despite the irrefutable evidence of the dangers posed by climate change, politicians still refuse to take the issue seriously. Speaking at the COP24, she said: “The year 2078, I will celebrate my 75th birthday. If I have children maybe they will spend that day with me. Maybe they will ask me about you. Maybe they will ask why you didn’t do anything while there was still time to act. Until you start focusing on what needs to be done rather than what is politically possible, there is no hope. We cannot solve a crisis without treating a crisis. Thunberg added that the world needs to “keep the fossil fuels in the ground” and to “focus on equity”. “We have come here to let you know that change is coming, whether you like it or not. The real power belongs to the people,” she concluded. Last week, Ireland’s performance in taking action against climate change was ranked the worst in Europe in a new report. The Climate Change Performance Index ranked Ireland 48th out of 56 countries, with a score of 40.84, far below the EU average of 60.65. The report examined a total of 56 countries and ranked them across a number of criteria to assess, to what extent, their actions were in line with commitments under the Paris Agreement 2015. Speaking to RTÉ Radio One’s Morning Ireland this morning, Minister for Communications, Climate Action and Environment Richard Bruton acknowledged that Ireland “needs to do an awful lot more” in terms of tackling climate change. Bruton said that Ireland has committed to reducing its emissions by 30% by 2030. However, he added: “We are starting that period, we will be way off track, we will be only 1% down on 2005. Instead of having being halfway through a process to 2030, we will be virtually starting out afresh. We have to massively accelerate the actions we are taking to achieve the commitments we have made for 2030. “There’s no doubt about it, we have the greatest ground to make up. We have our strengths, one of the things we have been good at is bringing renewables onto our grid, but we need to do that much faster,” he said. Email “15-year-old activist tells climate negotiators at UN summit they are 'not mature enough'”. Feedback on “15-year-old activist tells climate negotiators at UN summit they are 'not mature enough'”.